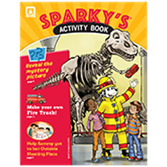 A mountain of action-packed activities fill the spectacular Sparky®'s Activity Books! What an engaging way for kids to learn about fire safety. Sure to be a kids'-favorite as soon as they set eyes on them, Sparky's Activity Books are packed cover-to-cover with games, riddles, puzzles, word finds, secret messages, and more! Each fun-filled activity relays important messages about staying safe from fire, including 2 ways out, household items that get hot and can cause burns, what to do if clothes catch fire, reminders that every bedroom needs a working smoke alarm, and what to do when you hear the smoke alarm beep.